Ambac Financial Group (ABK) continued to rise like a phoenix out of the ashes on Monday, more than doubling to close at $2.25. ABK, which was trading at 55 cents per share just a week ago, started its surge on Friday after reporting their Q4 earnings. The stock had been left for dead after multiple warnings from the company about a potential bankruptcy. Short sellers piled into the stock - according to Yahoo! Finance, ABK had a total of 55 million shares short as of March 15th, more than five times the stock's average volume over three months. It's clear that short sellers were caught flat-footed prior to Ambac's Q4 earnings report, and their exit from the stock helped the fuel the surge on Friday and Monday. ABK posted a profit of nearly $560 million for Q4/09, helped out by "nearly $500 million in tax gains and mark-to-market gains on its derivatives". 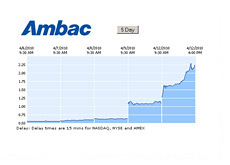 Ambac's gains on Monday were compounded by short-term traders entering the stock. These traders, seeing the company's large short interest, smelled blood and pushed the stock higher. It will be interesting to see if ABK can continue its move on Tuesday. More than 400 million shares of the stock traded on Monday as the company saw over $300 million added to its market cap. ABK is currently owned by two of the 40 hedge funds that we track - Caxton Associates and Citadel Advisors LLC. Caxton Associates LP owned 316,836 of ABK as of Dec 31/09, while Citadel Advisors LLC owned 58,702 shares of as Dec 31/09.